VLSI processor IP vendor Cast suggests EEs a smartest processor core choice, where the core is also offered with an evaluation kit. The processor core family is BA2x Processor Family running on evaluation kit called Talos Series. The evaluation kit allows “try before you buy,” offer running their own code and measuring benchmarks. These days electronic engineers are tilted toward selecting ARM Cortex M based processor cores for designing IC chips for wearable device and IOT applications. Here's an interesting processor core which offers the efficiency of ARM Cortex M4 and in the size of ARM Cortex M0+. See the comparison picture below by Cast. 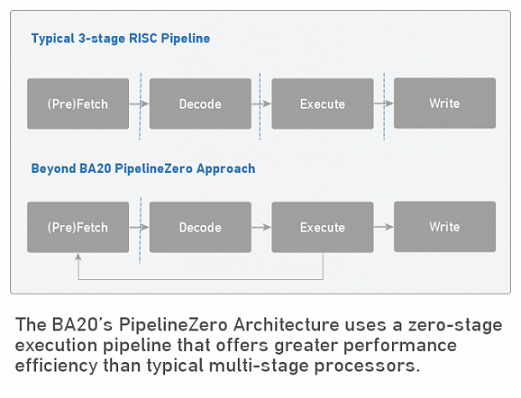 Designed to consume very low power the new BA20 Pipeline Zero 32-bit Embedded Processor IP Core, BA20 is called as new sweet-spot processor by Cast for applications not requiring the high operating frequency of modern three- or five-stage pipelined processors. Low Power Consumption:2µW/MHz in the same process technology. The BA20 Processor features single-cycle instruction execution of the BA2 Instruction Set. This processor core pushes itself into sleep mode more often and operates at lower clock rates. Has built-in support for advanced power management techniques such as power and clock gating and dynamic frequency to reduce power consumption further. Has a shorter branch shadow for less wasted energy. Designers can optionally augment the processor’s capabilities with a hardware multiplier/divider, a multiply-accumulate block, and IEEE-754 compliant floating-point units. A vectored interrupt controller facilitates timely responses to interrupts, and an optional memory protection unit protects application code and/or data from corruption. The core’s system interface uses a 32-bit wide AMBA AXI4-lite bus. Two tightly-coupled embedded memory (EMEM) buses allow fast access for time-critical code and data, and can be used for inter-core communication in a multi-core architecture. The royalty-free BA20 Processor IP Core is available in RTL source code or FPGA netlists, complete with the BeyondStudio Eclipse-based IDE. Various pre-integrated peripherals, memory controllers, and interconnects, non-intrusive JTAG or serial debug package, ready-to-run reference design boards are also available immediately. The FreeRTOS real-time operating system (RTOS) supporting the whole BA2x processor family can run on the Talos. A design example and ready to run FreeRTOS application, and a sample project setup prepared in the BeyondStudio Integrated Development Environment (IDE), is available for engineers to evaluate. The Talos Series Evaluation Kits are ready-to-run packages that combine a processor core implemented in an FPGA reference design board, a hardware debug adapter with connectors, and software including example designs. The BA2x Talos Series Kits feature Beyond Debug Key, which connects to a PC via USB and to the board via a standard JTAG or a proprietary Serial Debug interface. Designers program and monitor the processor system on the board using BeyondStudio. Talos Series Kits for BA2x with the BeyondStudio IDE now also include a complete, no-cost FreeRTOS. Users can get a Talos Series Evaluation Kit by contacting www.cast-inc.com. Learn more about Beyond Semiconductor by visiting www.beyondsemi.com.